but this was our time"
For Chicago Cubs superfan Dave Bruzza, guitarist and vocalist for Kalamazoo, Michigan quintet Greensky Bluegrass, the Cubs' dramatic victory in Game 7 of the World Series was especially moving. Bruzza, who has attended countless regular season games and 27 opening day games since 1985, broke down in tears upon hearing the news, while the band was deep into a sold out show at Belly Up Tavern in Solana Beach, California. Greensky Bluegrass quickly broke into Steve Goodman's fight song "Go, Cubs, Go." A video of the song, first posted on the band's Facebook page, has been shared 500 times, and has received 35 thousand views. WATCH: GREENSKY BLUEGRASS, "GO, CUBS, GO"
"I didn't know it, but when I was young I was chosen to be a Cubs fan," explains Bruzza. "My family had season tickets from the 80's to the late 90's. I spent a great deal of time growing up at Wrigley Field. I learned valuable lessons at all those games. Heartbreak, passion, unconditional love, respect, history, and most of all loyalty. My father, never once, would leave game early. In fact we would go in early to take it all in and leave late after the game to feel what thousands have believed in and cheered for all of these years. "Last night I felt like so many others something generations have never seen or felt, the Cubs winning the World Series. Not just winning, but being apart of, in my opinion, the best World Series ever played by two teams. My heart goes out to Cleveland, but this was our turn. They will get theirs soon and know and feel the same way I do today. As my grandfather would always say to me when I left for the game, "Bring home a winner!" I can't believe they finally brought home the biggest win of all time. I wish he was here to see it, but I know somewhere he was drinking an old style and smiling down with tears of joy with the rest of our family. Go Cubs Go!" 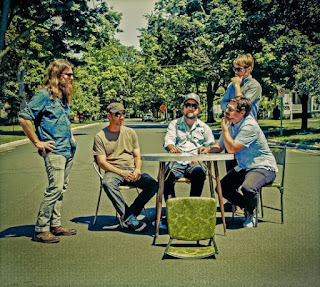 Greensky Bluegrass' new album, Shouted, Written Down & Quoted is out now via Big Blue Zoo Records/Thirty Tigers, and comes on the heels of sold-out shows at Red Rocks Amphitheatre and The Ryman Auditorium. Produced by Steve Berlin of Los Lobos, the band's sixth studio album debuted at #3 on the Billboard Bluegrass Albums chart. It also bowed at #5 on the Top New Artists Album chart, #13 on the Top Americana/Folk Albums chart, #21 on the Record Label Independent Current Albums chart, #45 on the Current Digital Albums chart, #52 on the Digital Albums chart and #91 on the Top Current Albums chart. In recent months, Billboard, Relix, and American Songwriter all premiered songs from the album, and Pandora debuted the album a week before its release date. Greensky Bluegrass are currently on the road, and just announced their winter tour dates.